In October 2011, after years of conflict with extremist groups on its eastern and northeastern borders, Kenya sent about 2,000 Kenya Defence Forces (KDF) troops into Somalia. Close on the heels of high-profile kidnappings and deaths of foreign tourists and aid workers, Operation “Protect the Nation” was launched with public fanfare and vague pronouncements about ridding Somalia of al Shabaab, creating a buffer zone against extremists, and protecting Kenya’s longer-term development plans (Downie, 2011; Branch, 2011; Zenko, 2011). Seven years later, Operation “Protect the Nation” continues with no clear end in sight. While campaigning for a second term, Kenyan President Uhuru Kenyatta made it clear that as long as an extremist threat is perceived to exist in Somalia, the mission will continue. Media reports have estimated that at least 1,000 Kenyan soldiers have died in action since the incursion began, and the military complement in Somalia has grown to 4,000 (Achuka, 2018). In the meantime, the operation has been tainted by allegations that senior Kenyan military officers and politicians are profiting from illicit trade in Somalia, using the conflict with al Shabaab as a reason for maintaining a heavy military presence in the region (Global Conflict Tracker, 2018; Rawlence, 2015). On the home front, Kenya has continued to suffer al Shahaab-inspired attacks, responsible for most of the country’s fatalities from political violence (Carboni, Roudabeh, & Clionadh, 2017), although some observers say the threat has been reduced (Hansen, 2018). Public opinion has been sharply divided regarding the government’s performance in fighting terrorism (Lekalake & Buchanan-Clarke, 2016). 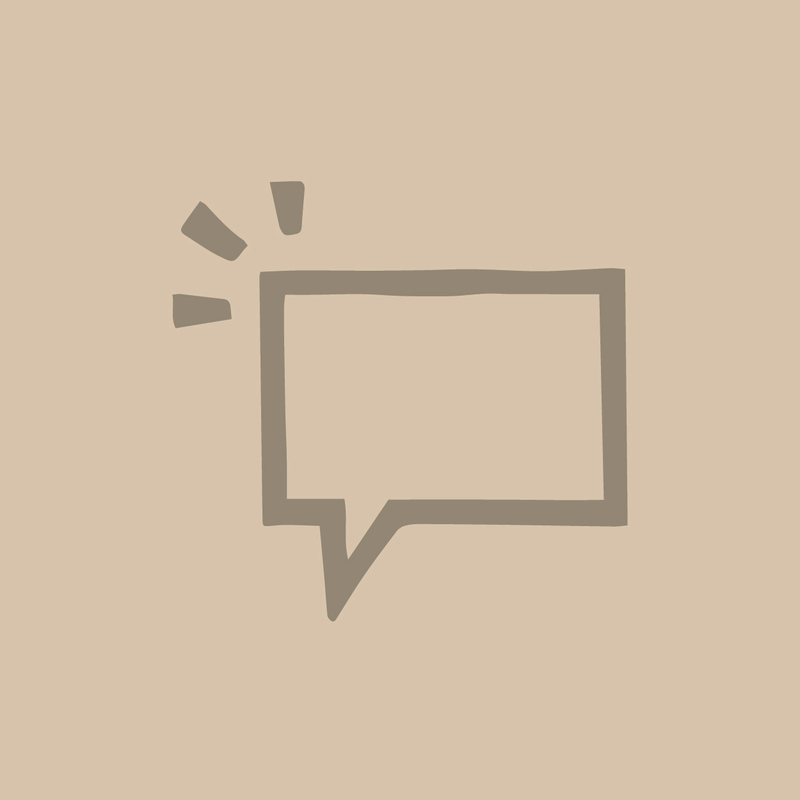 In the past, its domestic anti-terrorist crackdowns targeting the Somali Kenyan community have drawn particular criticism for violent and stigmatizing tactics that may actually contribute to radicalization (BuchananClarke & Lekalake, 2015). 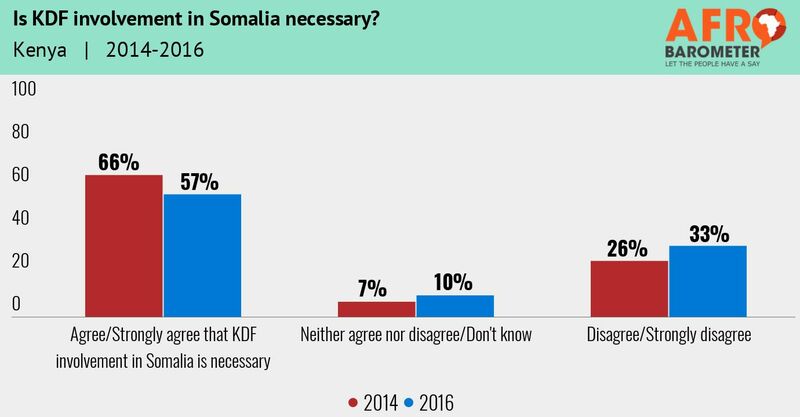 In light of these developments, we use 2016 Afrobarometer survey data to examine the attitudes of Kenyans toward KDF engagement in Somalia. We find that a majority of Kenyans see the KDF operation as necessary, although this majority decreased between 2014 and 2016. At the same time, fully half of Kenyans support KDF withdrawal from Somalia – a paradoxical finding that may suggest the population’s mixed feelings about the operation. Support for KDF involvement in Somalia is somewhat stronger among better-educated and wealthier Kenyans, as well as among citizens who fear and/or have experienced extremist violence. It is weakest in the North Eastern area, which shares a border with Somalia.